Scopri il meglio di Sydney quando prenoti questa combinazione di tour più venduti con un ottimo risparmio. che include un'intera giornata di visite turistiche a Sydney, seguita da una gita di un giorno sulle Blue Mountains. 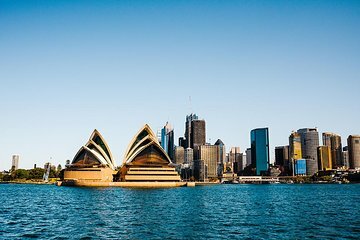 A Sydney, conosci la città e Bondi Beach in un tour in pullman, poi fai una crociera per il porto di Sydney per uscire in acqua. Visita le Blue Mountains quotate Patrimonio dell'Umanità, tra cui Scenic World, Featherdale Wildlife Park, Echo Point, Three Sisters, Katoomba e Leura, per poi tornare attraverso una crociera sul fiume Parramatta. Risparmia denaro e ottieni un'esperienza completa a Sydney con tre tour effettuati nell'arco di due giorni in una settimana. Impara la storia di Sydney e delle Blue Mountains dalle tue guide durante i tuoi due giorni di visite guidate. Assicurati di portare la tua fotocamera per fantastiche foto op di attrazioni turistiche. Quando prenoti il tuo tour della città di Sydney e la tua crociera, preparati per la data che preferisci, quindi prenota il tuo tour giornaliero Blue Mountains per il giorno consecutivo o qualsiasi data entro sette giorni del tuo tour della città di Sydney. Inizia il tuo tour della città di mezza giornata con il pick up dal tuo hotel a Sydney. Salite a bordo del pullman climatizzato e iniziate a The Rocks, il quartiere storico in cui è stata fondata Sydney. Fai un giro facile a piedi in The Rocks. Segui la tua passeggiata con un drive che passa davanti alla St Mary's Cathedral, ai Royal Botanic Gardens, a Hyde Park, alla Sydney Opera House, a Darling Harbour, a Kings Cross e altro ancora. Ammira le vedute sul porto di Sydney quando ti fermi alla sedia della signora Macquarie. Quindi attraversare quartieri esclusivi come Double Bay e Vaucluse in rotta verso una delle migliori spiagge australiane, Bondi Beach. Lì, prendi 30 minuti per passeggiare sulla sabbia o sul lungomare da solo, quindi torna a Sydney per la tua crociera pranzo. La crociera per il pranzo include un gustoso buffet con piatti stagionali caldi e freddi, pesce fresco locale, frutta e dessert. Ammirate le principali attrazioni del porto di Sydney durante la crociera di 2 ore, che scorre lungo il Sydney Harbour Bridge, la Sydney Opera House, Fort Denison e Shark Island. La crociera si svolge su uno spazioso catamarano con tutti i comfort moderni che ci si aspetta, compresi posti a sedere al coperto o all'aperto. Sbarca a Circular Quay o Darling Harbour, in una posizione perfetta per esplorare più di Sydney da solo. Dopo il trasferimento in hotel a Sydney, goditi una panoramica di 2 ore in auto per il Parco Nazionale Blue Mountains, sito Patrimonio dell'Umanità dell'UNESCO. Sosta lungo il percorso per il tè del mattino a Leura, quindi segui Cliff Drive fino a Katoomba Scenic World. Prendi una qualsiasi delle tre attrazioni di Scenic World (a proprie spese) o semplicemente passeggia attraverso la rigogliosa foresta pluviale e la passerella sopraelevata. Avere un pranzo al ristorante (a proprie spese) mentre si guarda oltre le formazioni rocciose di Jamison Valley e Three Sisters. Dopo aver mangiato, guida fino a Echo Point per un'altra vista di questi iconici monumenti delle Blue Mountains. Fermati al Featherdale Wildlife Park mentre torni a Sydney. Avere la possibilità di nutrire a mano canguri ed emù, e magari poi fare una foto con un koala (a proprie spese). Il tuo autobus ti lascerà al molo di Parramatta River. Imbarcati sulla tua spaziosa barca per una crociera panoramica che ti riporta a Darling Harbour o Circular Quay. Two long days of touring in a comfortable coach. Both days, the guides were knowledgeable and provided so much historical insights. Gray line customer service was amazing. Highly recommend for anyone who wants an introduction to Sydney and the Blue Mountains. Don't miss the opportunity to visit this beautiful area. We had plenty of time to walk around and do the scenic rides. If you only have two days to tour Sydney, this is an excellent value with minimal downsides. The visit to the animal park on the Blue Mountain tour is outstanding providing wonderful photo opportunities with Koalas and Kangaroos. However, the commentary providing during the boat ride lunch tour in Sydney; is difficult to hear. Depending on where you are sitting, it cannot be understood at all. The boat ride on the return to Sydney from the Blue Mountain tour is a waste of time. There are too many people crowded together in the seats. They keep the lights on inside the boat to keep the bar open and you cannot see anything from the middle seats. My wife and I would rather remain on the bus for the return to Sydney. The bus was more comfortable and we could see the countryside. We enjoyed a cruise around harbour it's nice view and Sydney Opera House and harbour bridge. Lunch on cruise is good. Best trip. Our drivers were terrific and every stop was a wonderful experience. Would do this again and suggest that everyone who visits Australia for the first time do these tours. Incredibly time well spent. Tour was great. Very informative tour guides. Safe bus and good driver's. Would recommend to make the most out of your stay in Sydney! The drivers were great. We thought Peter was very knowledgable about the area. The city tour and cruise hit the highlights and lunch on the cruise was excellent and plentiful. The Blue Mountain trip was a nice drive out. The scenery was was beautiful. I especially enjoyed the stop at the wild life park were you were able to get closer to the animals then at the zoo. We thought the cost at Scenic World was a little over priced for what you got. Felt we spent enough time at all the stops for both days. Half day Sydney tour culminating in buffet lunch on harbor cruise was very good. Lunch was much better than expected in terms of quality, selection and preparation. Stop at Bondi beach very nice. Walking tour with historical perspective in downtown was informative and interesting. Second day Blue Mountains tour was just OK: Scenic World fee was not included and rides were ridiculously short except for cable car at end. Dinosaurs looked so fake, mining stuff was ok, walk through rainforest also ok. The show on history of Australia was cheesy. Food not included but options at Scenic World were decent. Wildlife park was really a small zoo; koalas were sleeping probably due to heat in mid day; birds and kangaroos were interesting. Overall second day was just passable. I can't rave enough about this tour! We had 3 days in Sydney and this seemed like a great tour for 2 of them. Our guide Tony on Day 1 was terrific and informative; lots of great dad jokes haha. We did a walking tour of the Rocks (with the wonderful Catherine as our guide) and learned about the interesting history of Australia. We stopped by Mrs. Macquarie's Chair for a fantastic view of the Opera House and Bridge. Then went to Bondi Beach where we walked to the end to see Iceburgs Pool. The day wrapped with a lovely 2-hour harbour cruise that had a surprisingly delicious buffet and dessert. Day 2 was lead by Vince, who was extremely knowledgeable. We drove to the Blue Mountains. My tip: limit the rides because the lines are long. The real highlight was the boardwalk through the rainforest; I wish we'd focused our time doing that and the overlook. Do the Waradah show if you can to see a nice (somewhat cheesy) play about Australia's history. There's a great scene with a Didgeridoo performance. Lastly we headed to Featherdale Wildlife Reserve which has native animals, some I never knew existed! The perfunctory Australia photo with a koala made a really nice souvenir. We felt like we hit all the Sydney highlights with this tour, and were impressed with the stops and the guides. It's a fantastic value, too. IMPORTANT DEPARTURE TIP: If you don't opt for hotel pickup, the meeting point is behind the aquarium, *under* the overpass, on Wheat Street. It's a bit of a challenge to find, so give yourself extra time to get there.